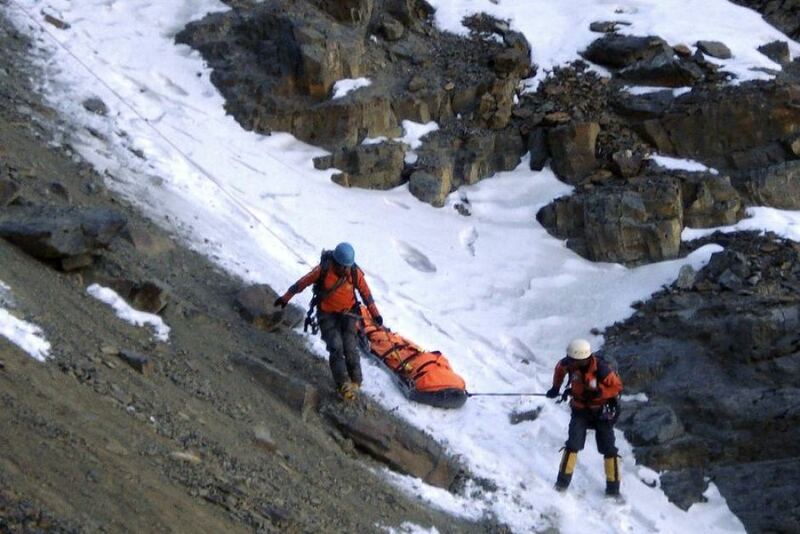 Members of a Bolivian rescue team carry the body of Australian climber Peter Cornelius Wiesenekker, who died while climbing the Tuni Condoriri mountain near El Alto, La Paz, on August 2, 2010. A former Brisbane man who fell to his death climbing in the Bolivian Andes last week was on a quest to climb the Seven Summits, his brother said yesterday. Peter Cornelius Wiesenekker was near the top of the 5,700-metre Tuni Condoriri on Friday when he plunged about 200 metres from a crag, according to local authorities. His body was found the next night with a broken leg, blows to the head and frozen from the cold. Mr Wiesenekker, 50, had been working as a police officer in the Northern Territory since 1995 and was on long service leave when the accident happened. Yesterday, family members in Brisbane were still reeling from the news of the avid mountaineer’s death. His brother Paul said Mr Wiesenekker had been away on the climbing trip for up to six weeks. “This particular trip he’s climbed in Switzerland, a couple of mountains in Peru and now he’s in Bolivia,” he said. The Seven Summits refers to climbing the highest peaks on each of the seven continents. Paul Wiesenekker said his brother had already conquered the fourth highest peak on the list, Mt Kilimanjaro in Tanzania, which towers to 5,892 meters above sea level. He said his brother had also climbed in Indonesia and across Europe. Tuni Condoriri is not one of the Seven Summits. Mr Wiesenekker, a father of two daughters, was on long service leave from the Northern Territory police and was due to return to duties at Jabiru on August 23, according to the NT Police Force. He joined the NT Police Force in 1995 and served at Palmerston, Casuarina, Daly River, Nhulunbuy, Port Keats and Maningrida. German climber Isabel Suppe, 31, was lashed to Mr Wiesenekker when he fell on Tuni Condoriri. She is reportedly recovering from her injuries in hospital. Paul Wiesenekker said his brother set out from Australia alone and linked up with acquaintances from previous climbs. “On this particular trip he was travelling independently and with people he had met on different trips,” he said. NT Commissioner of Police John McRoberts said Mr Wiesenekker’s untimely loss would be acutely felt throughout the police service and the wider community. “Our deepest condolences go out to the Wiesenekker family, especially his daughters Emma and Laura,” he said. Mr Wiesenekker’s death comes just over a year after Melbourne graphic designer Mick Parker, 36, died after returning to Kathmandu from the 8462-metre Himalayan peak of Makalu. He had made the climb without oxygen and suffered oedema – a build-up of fluid – and blacked out several times on his way back to Kathmandu after successfully reaching the summit of Makalu on May 21. The body of an Australian man killed while mountaineering in Bolivia will be returned home early next week. Northern Territory police officer Peter Wiesenekker was killed while climbing in the Bolivian Andes last week. Senior Constable Wiesenekker was fatally injured when he and his guide fell about 200 metres from a crag. The guide survived. Senior Constable Wiesenekker was on long service leave from the Territory police force. He had served in the Queensland police force before moving to the Territory in 1995. He took up mountaineering several years ago after giving up smoking. He had set himself the goal of climbing the world’s biggest summits, and had trekked Kilimanjaro in recent years. His brother Paul says the family is coping as well as can be expected. They have been told that Senior Constable Wiesenekker’s body will be returned to Australia on Monday or Tuesday. A police funeral is expected to be held in Brisbane late next week. The talk in the local Jabiru Supermarket this week was of the tragic death of local Senior Constable Peter Cornelius Wiesenekker. Peter died doing what he loved, climbing mountains. He took up the sport after giving up smoking. He was on long service leave prior to taking a transfer from Jabiru. He was stationed at Jabiru for four years. 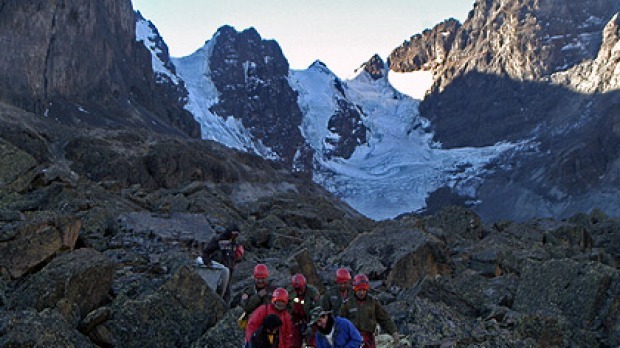 Peter an experienced climber fell 200 metres from a crag to his death while climbing near a 5,700-metre peak in the Condoriri mountain range, in the Condoriri National Park in the Bolivian Andes. Near the small village of Tuni set in Llama pastures. Condoriri is a group of mountains that soar above 5,000 meters. Their 13 peaks form a circle. The name Condoriri comes from the formation’s resemblance to a condor with outstretched wings. Condoriri National Park’s stunning glacial mountains accessible by pack animals could not be more different than Peter’s home in Kakadu National Park. Peter a quiet man lived his life to the full. Peter’s has two daughters in Victoria and family in Queensland. Local information is a limited, it appears that Queensland funeral directors have been engaged and are in the difficult process of retrieving Peters remains from Bolivia. Peter was well respected here in Jabiru and his death has come as a shock. His name is now mentioned in subdued tones. In Jabiru Peter could be seen formally in his clean cut pressed uniform seeking me out in my capacity as a the local Justice of the Peace. In order to get court papers signed. I new him as a reserved professional officer with a rye smile and a dry wit. On his days off Peter could be seen in his not so pressed shorts, singlet and thongs with a bigger off duty smile. Jabiru and Kakadu will miss him deeply and our thoughts go out to his family. We were safe under his watch. Post Script; Peter’s funeral was held on Friday the 13th. August in Queensland.